I was not a popular person at my first Super Bowl party. My boyfriend at the time brought me to his friends’ house over my rather loud objections. He promised I’d enjoy myself, that we’d eat chili and drink beer, and that even if the game was boring, there would be funny commercials. The group split in what I know now is a fairly traditional way – most of the guys in the living room, watching the game, and most of the girls were in the kitchen chatting and eating the snacks they’d prepared. Not knowing what to do, I stayed near my boyfriend. Being a Third Culture Kid, I know it can take years before the rituals and minutiae of social events normalize. 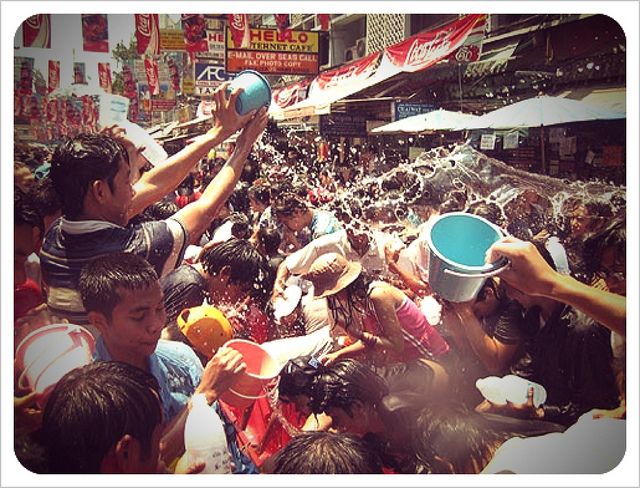 Having grown up in Thailand, I remember being mystified the first time Songkran came around just as much as I remember gleefully joining in on the water fight by the time our third year rolled around. Festivals and traditions, like humour, seem to be some of the hardest things to translate. By the time I got to this Super Bowl party, I had been living in the United States for a year and a half, and had hit the point where I was expected to know things. My first few months in the States, it was accepted that I was only semi-American, and people were patient. I was taught about jaywalking and how to drink cheap liquor. I learned about team rivalries, and to never say anything nice about the Dallas Cowboys in D.C. But I was also constantly running into new situations I didn’t know how to navigate, and this Super Bowl party was one of them. I found a corner on the couch and stayed put, overwhelmed by the sheer volume of things I did not understand. There was a whole vocabulary that I was expected to know for a sport I’d only seen a handful of times. There were white lines and blue lines and yellow lines on the field, and more numbers floating around than I could keep track of. “Why did they stop there? The yellow line was right in front of him! Why couldn’t he just keep going another foot?” I asked at one point. I was proud of myself for even knowing he had to cross the yellow line. The weight of expectations washed over me all at once. I was the one asking the silly questions. I was the one failing to conform. I was the one that needed to try harder to rediscover the Americanness that everybody else seemed sure I had stored away somewhere in the back of my mind. I had to translate who I was and every experience I’d had overseas to make it acceptable to my peers. To make it American. I was a translation of myself, and a poor one. A few months ago, I moved to Denmark for the summer as part of a work rotation. I got off of the plane knowing nothing about my new home except the city I lived in and the date and time I was supposed to report to work. When I landed in Copenhagen, I couldn’t even say hello. Honestly, I do more research for a 2-week vacation than I did for my four months here. My first night out, I was amazed at how generous everybody was with drinks. Round after round showed up before I even had to think about it. As a girl living in the South, I have become accustomed to having drinks bought for me and I thought nothing of it. After a few weeks, my coworker gently suggested that I should go to the bar with him and buy a round for everybody. “It’s just a lot easier to do rounds. That way everybody doesn’t have to go to the bar at once.” There was no finger pointing or accusation about not doing my part, or an assumption that I should know better. Having seen several people make the same work rotation into our hybrid Danish/international environment before, they were used to seeing how new people behaved and acting as their cultural translators. He explained that at the bar, we used a round system, and that if I ever didn’t want to be a part of it, to just buy my own drink and it would be fine. On a daily basis I interact with not only Danes, but South Africans, Brits, Kiwis, Filipinos, and people whose cultural background is as varied and confusing as mine. Every night out involves more acts of cultural translation than people attempted with me in 8 years living in the States, and I find myself more grateful for this experience than I thought possible. Not for the networking, or the potential for career advancement, though those certainly help sweeten the deal. I was given 4 months to feel like myself again and to have people accept who I am and understand that I am neither bragging about nor putting down the life I have lead when I talk about it. We are all translators here, not translations. I explain what I know of American culture or Thai culture or Panamanian culture when it comes up in the office, and my coworkers do the same when we run into cultural confusion with other countries. Without the assumption that we should all be alike, communication is an active thing. We listen to one another and translate events into our own experiences, or drop small explanations into our stories when we can tell our audience is getting lost. It is a small change, but an important one. Here I can translate my experiences without needing to translate myself. I don’t need to alter parts of my life story to make my friends more comfortable, and I can ask questions without feeling like I’m breaking a rule I didn’t know existed. Home is not a physical place for me. Home is translation. Born in California, Sarah has lived in the US, Thailand, Singapore, Spain, Panama, and Denmark for various lengths of time. She is a graduate of the University of Mary Washington and spends her free time writing and planning her next big adventure. Sarah's blog. We are a community effort and are rewarded when you 'like,' comment or share our essays. If you enjoyed this piece, please take a moment to 'like' or share. This is amazing Sarah! Great story, I really enjoyed it!